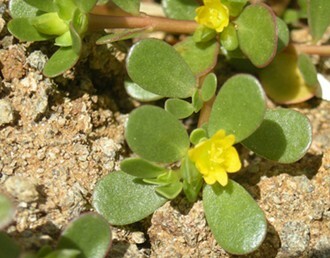 This page contains detailed information on summer annual lawn weeds, such as Black Medic, Carpetweed, Common Purslane, Pineapple Weed, prostrate knotweed, Spotted Spurge and Yellow Woodsorrel. For additional aid in lawn weed id, you will find weed names, photos, the conditions that promote that weed's growth and how to control it. Some weeds can be controlled without herbicides, while others will be harder without using them. An “annual” is defined as a plant that germinates from seed, grows to maturity, produces seed and dies within a 12 month period. However, most annuals only live for half a year at best, with a few exceptions. Annual weeds will either be “summer annuals” and “winter annuals”. This page is for summer annual lawn weeds. Summer annuals will germinate in the spring or summer, depending on the weed, and die with the first killing frost. Since annuals die each year, they must come back the following year from seed. To ensure their survival, most annual lawn weeds produce enormous amounts of seed. Some plants can produce several hundred thousand seeds each year. They are quite successful since annual weeds are some of the most abundant weeds on earth. Lawn weeds don't like competition, so a thick lawn turf is your greatest defense against weeds. Focusing attention on weed control without building a thick turf is a guarantee you will have continued weed problems. The lawn weeds listed on this weed identification page are not an exhaustive list and you may have other lawn weeds common to your geographical area. Be sure to check with your local university extension office for specific conditions in your area. Important notice: A mention of any herbicide on this website is not an endorsement, but is only a list of commonly used and effective products. Herbicides should be used as a last resort. Remember, that herbicides can be dangerous, so be sure to read the entire label before using. Please note that different states, or even regions within states, may have specific laws pertaining to herbicide use or specific products. Your local university extension office can be a great help in determining what products are available and legal for you to use. Not all herbicides are available for homeowner use and the EPA is removing or adding herbicides frequently. Always use and store products according to instructions on the label. Member of the legume family. An annual that can act as a perennial. Three oval leaflets with the center leaflet on a separate stem. Each globular flower is comprised of about 50 or more individual flowers. Generally grows in poor quality turf. Black medic is a summer annual lawn weed, but in the south it can act as a perennial. It is a low growing plant with trailing stems. The plant can grow to maturity well below the height the mower blades in most lawns. It has three small leaflets. 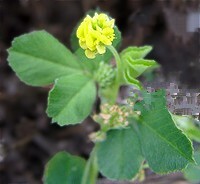 It is similar is some ways to other legumes, like clover, but the size and shape of the leaflets are different. Unlike white clover, black medic has a taproot and does not root at the nodes. The stems of black medic are multi-branched and can reach 24 inches in length. The flowers are a bright yellow cluster of tiny pedals in a globular shape. A single plant can produce dozens of flowers. The seed pods turn black at maturity. Research on the plant show antibacterial properties and may someday have some uses. Right now it has some limited use as a forage and cover crop, but remains a pest in lawns. Black medic tends to grow best in poor quality turf. It is often found in thin turf areas that are low in nitrogen and phosphorus. Therefore, the best method of keeping it out of your lawn is to encourage a thick, vigorously growing turf. Make sure the nitrogen and phosphorus levels are right for the grass type you have. The “Grass Types” and “Fertilizer” sections of this site can help you. Since black medic has a tap root, it can be pulled by hand. However, the seeds will continue to be a problem for the following years. The use of a preemergent herbicide will help prevent seeds from germinating. If hand pulling is not an option for you, there are several herbicides that are labeled for black medic. For homeowners, look for broadleaf herbicides containing Dicamba plus 2,4-D. Try to find herbicides with three or four active ingredients combined for the best effect. 2,4-D alone is not enough to control this weed. Other post-emergent broadleaf herbicides are Triclopyr, MCPP and Clopyralid. Isoxaben is a preemergent labeled for black medic. Grows prostrate along the ground. Light green leaves that grow in whorls. 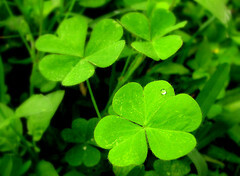 Whorls have five to eight leaves that are widest in the middle and narrowest at the base and ends. Small white flower with five petals. Carpetweed is a summer annual weed that grows prostrate along the ground. It is sometimes confused with other lawn weeds, such as Carolina Geranium. Once the seeds have germinated it can grow and spread quickly. However, it doesn’t like competition from turfgrass, so it is most commonly seen in dirt patches or in thin grass. It forms long, smooth stems that branch out in all directions. The leaves of carpetweed grow in whorls along the stem. This is one of the unique qualities of this weed. Each whorl is set a distance from the next whorl on the stem so that the leaves barely touch each other. 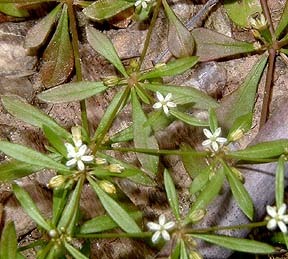 Carpetweed produces small, white flowers with five petals. Each whorl will produce two to five flowers that grow from the joint between the leaves and stem. Carpetweed will climb if growing next to a fense, but will grow prostrate in open ground. The prostrate growth habit prefers sparse areas where lawn grass is thin. These thin grassy areas also allow the seeds to receive enough sunlight to quickly germinate as soon as the soil reaches the proper temperatures. The best way to keep carpetweed and other lawn weeds under control is to have a thick, vigorously growing lawn. This will keep most lawn weeds out and cut down on the amount of herbicides used. Established weeds can be pulled up by hand. One way to control carpetweed is to use preemergent herbicides. Preemergent herbicides work by blocking seeds from germinating, but will not affect growing lawn weeds. Many preemergents are available to homeowners. Oryzalin, pendimethalin, or benefin are examples of available products. Once the weed has established you will need to use a post- emergent herbicide. Products with three or four active ingredients are best for most lawn weeds. Dicamba plus 2,4-D should be two of the active ingredients in the formulation. Summer annual with a prostrate growth habit. Leaves are smooth and succulent with an oval shape. Reddish stems branch out from a central point like spokes on a wheel. Small yellow flowers with five petals. A single plant may produce over 200,000 seeds each year making it difficult to control. 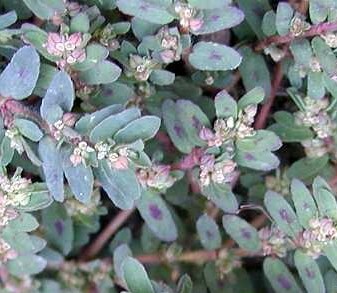 Common purslane is a edible summer annual found throughout the world. In some countries it is considered a minor crop. (However, weeds growing in lawns should not be eaten.) It is generally found in low maintenance areas and in poor quality lawns. These lawn weeds will usually first appear in dirt areas or along edges of paths or sidewalks. It prefers dry conditions but will compete well in wetter soils. Due to the enormous amount of seed the plant produces, once they germinate, it can spread quickly. Seeds will germinate when the soil temperatures reach 60 degrees. As with other annual lawn weeds, common purslane must germinate, grow, spread, and produce seed to ensure a future crop, all within the one year life cycle. For positive weed identification, look for lawn weeds with reddish brown stems that can reach 12 inches long. The stems branch out in a spoke fashion. Other stems will branch off a main stem. The leaves will be attached to the branching stems and not usually the main stem. The succulent stems and leaves can remain moist and firm for several weeks into a dry period. 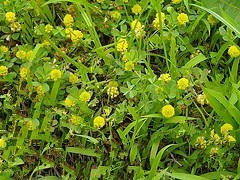 Also look for lawn weeds with small yellow flowers having 5 or more petals. These flowers will usually open on sunny mornings. 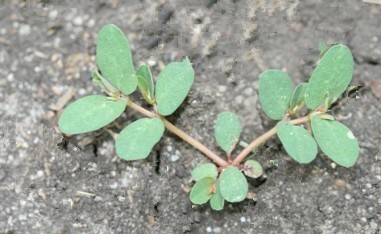 Common purslane lawn weeds are usually not a problem in well established turf. It is a weed that prefers less competition from other grasses. The best way to keep out purslane is to work on maintaining a healthy turf. If the weed is established, pulling it up by hand will only be a temporary fix. Due to the enormous amount of seed, unimproved lawn areas will continue to have problems. Maintaining a thick turf at the highest mowing level for your grass type will shade the soil and prevent common purslane seeds from germinating. However, seeds can remain viable for up to 40 years in the soil. If you decide to use a herbicide for control, look for one containing 2,4-D and Dicamba. Many herbicides formulations will be a three for four herbicide mixture for controlling a wider variety of weeds. However, not all individual herbicides, when used alone, will control all weeds. When spraying purslane, make sure the formulation you use contains the two herbicides mentioned above and is labeled for control of common purslane. Easily grows in compacted, rocky soil. Has a pineapple smell when cruched. Light green flowers that somewhat resemble a pineapple in shape..
Can be difficult to control especially in dirt or gravel areas. Pineapple weed, also called wild chamomile, is a common summer annual weed that grows in compacted and thin turf areas. The leaves of pineapple weed are finely divided and give off a sweet pineapple smell when crushed. Mature plants can reach 12 inches tall. The plant has a single taproot with stems that branch out from the base and grow vertically. 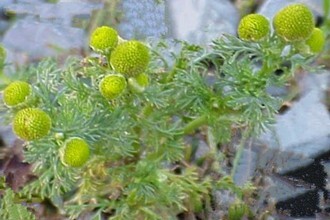 Leaves of pineapple weed are hairless and are arranged alternately on the stem. The flowers are a light green in color and somewhat resemble a pineapple in shape. They are positioned at the end of the stems. Pineapple weed spreads by seed. It originated in the west, but now is found throughout the U.S.
Pineapple weed doesn’t usually grow in thick turf. It grows along the edges of gravel or dirt driveways or in compacted, thin turf areas. The best way to keep this weed out is to make sure you are promoting a thick, vigorously growing turf. Pineapple weed can be pulled by hand because of the taproot. Lawn weeds that grow dirt or poor quality turf will be harder to control because there is plenty of light for seed germination and nothing to discourage them from growing. For this reason, pineapple weed will likely keep returning. If the pineapple weed is growing on the edge of the driveway or along the edge of your grass, careful use of Glyphosate (i.e. Round-Up) will control it. Don’t use Glyphosate in grass areas, because it is a non-selective herbicide. This means it will kill all grassy vegetation that it touches. Summer annual that thrives in compacted, rocky or poor soils. Has a prostrate growth habit and produces tough stems. Leaves are blue-green in color. White to green inconspicuous flowers. Common knotweed, also known as wireweed, is a summer annual found throughout most of the U.S. and Canada. It is the earliest germinating summer annual lawn weed. In March or April when it seems like new grass is growing in damaged areas, it often turns out to be knotweed. Knotweed is sometimes confused with prostrate spurge. (See weed information below.) Prostrate (spotted) spurge is a late germinating summer annual and appears around mid-summer. If grows easily in compacted soils and is found along paths, construction sites, fields, orchards and the like. It has a deep taproot and can survive periods of drought. Because of its prostrate growth habit, it doesn’t grow well in established turf. Common knotweed is a slow growing weed. Depending on where you live, it can germinate in mid-spring and resembles grass seedling when it first comes up. By mid-summer it is clear that it is not grass. It can form mats up to three feet in diameter. The stems are quite tough. In moist soil, pulling a stem will sometimes pull up the entire plant. The main stems are home to many smaller stems branching off of it. The leaves grow from these smaller branching stems. Tiny flowers bloom throughout the summer. Since common knotweed grows in compacted soil, the best way of preventing weed growth is to aerate the soil. Aeration alone won't prevent its growth, but with over seeding or plugging to fill damaged areas, the knotweed problem will go away. Common knotweed has a single taproot and can be pulled by hand. It is best to do this when the ground is moist after a rain or thorough watering. In late summer after the plant has hardened, the plant is difficult to control with herbicides. The best time to spray is while the plant is young and growing. Using a formulation containing 2,4-D with Dicamba will be effective. In dirt areas, using a non-selective herbicide with glyphosate (i.e. Round-Up, Rodeo, etc.) will work. Use caution and read labels completely before mixing, using or storing herbicides. Low growing summer annual that forms a dense mat. The leaves have a reddish, elongated mark down the center. Stems produces a white, milky sap when broken. Germinates in spring, but is usually not noticed until mid-summer. Grows from a taproot and does not root at the nodes. Spotted spurge, also called prostrate spurge, is a common low growing weed along roadsides, paths, gravel driveways or poor quality lawns. It is also on the list of common garden weeds. Like many other summer annual lawn weeds, it grows well in compacted soils and prefers areas with little competition with other grasses or weeds. In mid-summer you will first see this weed growing next to driveways, sidewalks or roadways. The soil temperatures will need to be between 75 and 85 degrees for seed germination. The soil next to concrete walkways and roads will heat up faster than in other places and many summer lawn weeds begin there. You will find them growing in rock gardens about the same time. For proper weed identification look for spotted spurge growing from a central taproot. The root can extend well over a foot into the soil. The stems spread out from the center like the spokes on a wheel and do not root at the nodes. If you break a stem, you will see a white, sticky, milky sap flowing from the broken ends. Another key to weed identification is to look for a reddish stripe down the center of the leaf. Spotted spurge is poisonous and will injure or kill livestock that consume too much. The best method of eliminating spurge is prevention. Once it is established, it can be difficult to control. Monitoring the garden areas, dirt next to driveways, etc. (including cracks in driveways), will signal you as to when a new crop is arriving. Try pulling them before they go to seed, which can be five to six weeks are germination. Work on keeping you lawn thick and healthy since spurge does not grow where there is heavy competition from turfgrass. Most homeowner types of herbicides have a hard time controlling spurge because it is difficult to penetrate the waxy leaf cuticle. Adding the appropriate amount of a “sticker/spreader” will aid in absorption. Sticker/spreaders cause herbicides to stick to plant tissue and flow out evenly over the surface. It can be purchased at lawn and garden stores. Although a number of herbicides are labeled for spotted spurge, their effectiveness is questionable. Non-selective herbicides (i.e. Round-up) will offer the best control. For serious problems, using a preemergent will help keep seeds from germinating. Preemergents with active ingredient such as pendimethalin, or oryzalin will work. There are several others as well. A summer annual that grows in shade and sun. Weak, woody stems that root at the nodes. Very distinct heart shaped leaves. Seed pods explode spraying seed for several feet in all directions. Yellow woodsorrel, more commonly referred to as “Oxalis”, is an annual (sometimes a perennial) that is a major weed pest throughout the U.S. It is a low growing plant that roots at the nodes. A node is a small swollen section along the stem where new stems or roots can emerge. The stems are weak and will break where the stems root. This prevents complete removal of the plant by hand pulling. The leaves are perfectly heart shaped. Each leaf consist of three small heart shaped leaflets attached by a long stem. Flowers are yellow with five small petals and may be grouped in clusters of five or more. The seed pods are somewhat unique. Each seed pod will hold up to 50 tiny seeds. After the seed pods mature, anything that brushes against it will cause the pod to explode, spraying seed up to eight feet. Over a period of time, seeds can cover an entire yard. Yellow woodsorrel spreads by seed and usually invades thin turf areas. Thick turfgrass offers resistance to germination and spread of this weed. Attempts at pulling it up by hand may be helpful in reducing the amount of weed present, but since it roots at the nodes it will grow back. Separating a rooted stem from its mother plant forces the stem to become an individual plant. Lawn weeds spread much faster this way. A much better use of time would be to improve lawn conditions so it does not favor weed growth. This will slow the weed growth of many weeds types. If the problem is severe, herbicides may be needed. There are currently no selective herbicides that give sufficient control of yellow woodsorrel in warm season grass. For Cool season grass, only Triclopyr is effective. 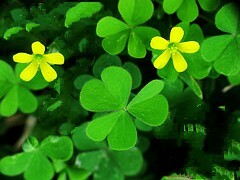 Although several herbicides may be labeled for yellow woodsorrel, most are not very effective. However, for an additional choice, look for a formulation containing MCPP, 2,4-D, and Dicamba. Add a "sticker/speader" to the mix according to the label instructions. Sticker/Spreaders cause the chemical to stick to the plant and lay out evenly over the surface of the leaf instead of rolling off. This improves the absorption and gives more effective control. Another method may be a preemergent. Materials such as Isoxaben, Oryzalin, Pendimethalin can be effective as long as it is applied before seeds germinate. Crabgrass and Foxtails are two major annual weeds that can cover your lawn. You will find detailed information on their growth habits and how to control them before they even start. Winter annuals can be very difficult weeds to control. Find out what make these lawn weeds tick and what measures can be taken to control them.